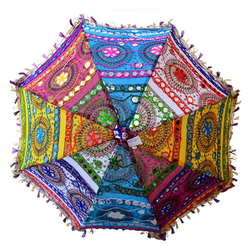 Colourful Rajasthani Embroidery Umbrella in different specifications and designs available. Customization of sizes possible. Beautiful Indian Handmade patch work emroided garden umbrella is by village artists in Rajasthan. 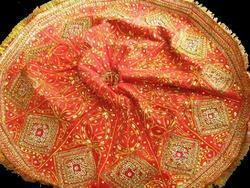 Rajasthni Handwork emrboidery Gujrati Work Umbrell/Parasol. It's pretty and practical! You can use it as cover from spring showers or as shelter from the rays of the noonday sun. We are involved in offering our customers a wide range of handicraft Decorative Sun Umbrellas. These Decorative Sun Umbrellas are manufactured using fine quality material that can withstand harsh sun rays and prevent these from fading. Our offered products also provide high tear strength and durability to the users. Bored with the regular black umbrella. this handcrafted umbrella made up of cotton cloth is essential for the approaching summer season. Prepared by traditional artisans of jaipur the exclusive design is decorated with the sparkling beads work on the top of the umbrella and finished with aari tari lace.